In a manipulation act, nothing elicits oohs and ahhs from an appreciative audience more than playing cards displayed in elaborate fans that change color, size and even magically divide seemingly at the magician's will. This video is an information tour de force on the arcane subject of creating elaborate fan displays using playing cards. 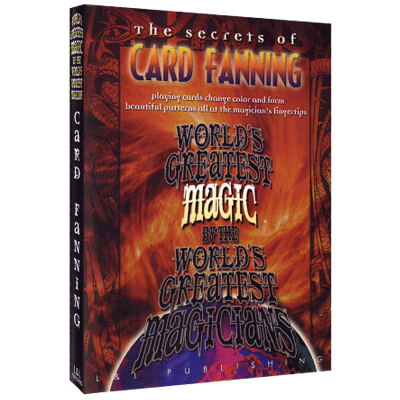 First, master manipulator Alan Shaxon supplies all of the basic information you'll need to know to get started, including the types of cards to use, their preparation, and the elementary techniques. Then, Jeff McBride, a modern master of card manipulation, goes into even more detail on the fine art of fanning playing cards. Finally, the godfather of street magic, Jeff Sheridan, adds some more touches and ideas to round out your education. Henry Hay, in his classic The Amateur Magician's Handbook, said of card fanning, "More than any other flourish, fanning has to be taught by example rather than precept." You'll soon be discovering that, short of personal instruction, this video suits Mr. Hay's intention perfectly.